Four ways to upgrade your typical takeout dinner plan—inspired by some of our favorite dining experiences. Chefs all over the country are helping create dreamy outdoor eating scenarios. Here are four ways to upgrade your typical takeout dinner plan—inspired by some of our favorite dining experiences. 1. The Fantasy: Tapas time at Barcelona’s legendary La Boqueria Market. The Reality: A sunset picnic at New York City’s High Line park. 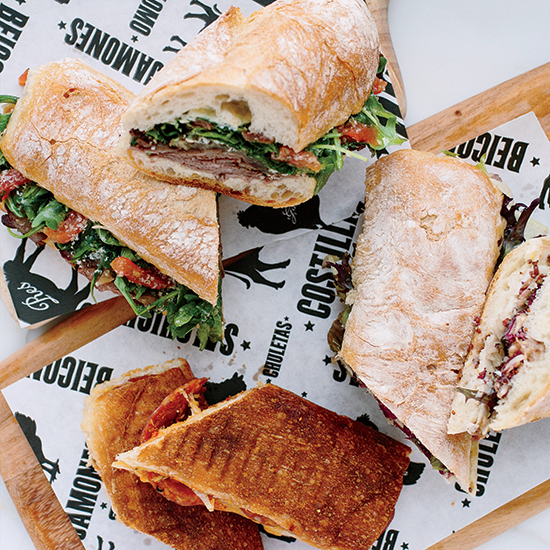 The Food: Sandwiches stuffed with marinated steak from El Colmado Butchery. 53 Little W. 12th St.; elcolmadonyc.com. 2. The Fantasy: An afternoon on the Seine in Paris. The Reality: Lunch in downtown Los Angeles’s Grand Park. The Food: A baguette and a jar of rabbit rillettes from Sqirl Away. 720 Virgil Ave.; sqirlla.com. 3. The Fantasy: A seafood snack at North Carolina’s Cape Hatteras National Seashore. The Reality: A backyard barbecue in central Raleigh. The Food: A bushel of oysters to grill with Tabasco-bacon butter from Standard Foods. 209 E. Franklin St.; standard-foods.com. 4. The Fantasy: A trailside meal in New Mexico’s Gila National Forest. The Reality: Lunch on a bench in Santa Fe Plaza. The Food: Barbecued quail sandwich and cactus pear salad from Eloisa. 228 E. Palace Ave.; eloisarestaurant.com.